This is the first photo in a series of scenes from Seattle that I’ll be sharing this week as I wander about the Pacific Northwest. I hope you enjoy this view through the epicurean looking glass of my favorite haunts and new discoveries. As a fan of Molly Wizenberg’s Orangette, visiting her pizza shop, Delancey, has been high on my food blogger must-do list. Given Molly’s status in the food blogging community, a simple visit becomes something akin to a food blogger pilgrimage. And let me say that given our taxi mishaps that evening it felt like one too. 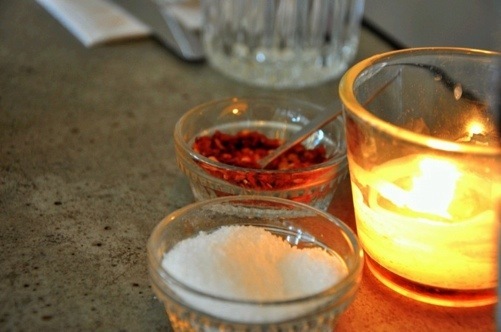 While you might expect a pizza photo as a memento of our visit, something about these small dishes of salt and red pepper by the single candle in a glass votive stood out to me as the best expression of the refined simplicity that is Delancey. Yes, the pizza rocked. So did the charcuterie plate with the best olives I’ve ever eaten. So did the staff and ambiance. So did the funky Seattle neighborhood in which it was nestled. Everything about the evening and the food was just right, just like this just right photo of salt, red pepper flakes, and a flickering flame.